I listen to your news report in the shower every morning because you're really good at one thing: keeping time. It is unfortunate that I must also consume your journalistic drek while I rinse the Herbal Essences from my hair. "Want to know how you can save money in this tough economy? We'll tell you after the break!" "Coupons! 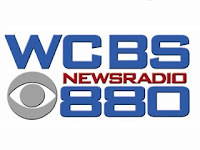 WCBS News time: 7:36." Secondly, I really enjoy how you blur the lines between your tiny reports and your obnoxious commercials. They flow together so effortlessly. For instance, did you know that the weather on Thursday will be partly cloudy with a chance of McDonald's Bacon-Grease-Cheese-Muffin Breakfast Sandwhich? Then you have this strange feature called "The 411" where you invite listeners to go on your website and vote for the story they want to hear more about. The winning story will then be covered "in-depth" (20-25 seconds?) at 4:11 and 8:11 PM. Lastly, allow me to address my number one peeve with your broadcast: Joe Connolly from The Wall Street Journal, or as I like to call him, "Captain SmugTastic." The man reports financial news with the iron-clad authority of Nero, and the specificity of an Alberto Gonzales hearing. "A man in New Jersey got a haircut and did not leave a tip." "Some people are saying that the economy may improve by July." "A woman in Manhattan ate a salad, but could not afford the dressing." This is not journalism! These are anecdotes my father tells at the Outback Steakhouse! In what universe can you pass along random, un-sourced, word-of-mouth information and call it news? And why is 880 AM the strongest signal on my shower radio? How I miss you NPR, with your insightful coverage, and your no commercials, and your anchors who speak with "inside voices." Maybe I should just get a waterproof clock. I'd sooner shower in silence than listen to the drek spewed from WCBS-AM. 1010 WINS or bust for news, man.